Lyndsay Faye’s The Gods of Gotham is terrific history and terrific crime fiction. It’s 1845 and New York City is a sprawling, brawling mess. Slums abut fine townhouses, corruption is the rule of law and the last word in politics, the virtuous hate the bawdy houses, the Whigs hate the Democrats and everyone hates the Irish. When a disastrous fire destroys the oyster bar where he worked and the apartment where he kept his life savings, Timothy Wilde thought he had tasted the worst of it. But his big brother Valentine, a drug-addicted, politically notorious firefighter, finds him a job as one of the new “copper stars,” a nascent police force that isn’t exactly welcome in the wild west of the crime-ridden wards. The loss of his savings means Tim can’t ask his lifelong love Mercy Underhill, a preacher’s daughter, to marry him. The horrible new scars on his face make him look like a ruffian, Valentine has always been a fight waiting to happen, and fire spooks Timothy Wilde–his parents died in the fire that destroyed their farm and orphaned the brothers. Pretty soon the new job spooks him, too. He finds decent lodging over a widow’s bake shop and discovers he is as good at figuring things out as he was at listening to the customers in his bar. Despite himself he begins to get interested in policing his ward–and then a small girl in a nightdress, covered in blood, flies out of the night and crashes into his life, setting off a conflagration more horrible than any fire. Bird Daly has escaped out the window of the brothel where she lived. She’s an accomplished liar and so winning that Tim is completley captivated by her. But she knows things she won’t tell and she is frightened. The bloody nightdress is finely made and goes unexplained. Tim decides not to send her to the infamouse children’s refuge and stows her in his boarding house instead. But Bird is the beginning of a tale so bizarre and depraved that it could tear the city apart. Wilde is in it up to his neck and what he finds out shakes his faith in everything he believed about his world. Wonderful characters. Great dialog–Faye uses colloquialisms of the time and the language is so foreign that she posts a glossary at the beginning of the book to help you figure it out. Manhattan is its own colorful self–decadent, demented, fabulous and roiling with racism, rough talk and even rougher behavior. Children are pressed into service as prostitutes, abandoned to the streets to work as pickpockets or newsboys, as calculating as hardened criminals and as vulnerable as the victims they too often are. Someone is fanning the flames of anti-Irish sentiment and the new “coppers” are in danger of being dispersed before they ever solve any major cases or clean up a fraction of the filthy streets. The Gods of Gotham is full-on and non-stop. I loved it. I hope Faye plans a few sequels that are just as strong and irresistible as this introduction to New York’s Finest in a chapter of the city’s history that was anything but fine. Libraries are the repositories of the soul of our societies. They hold the wisdom and follies of ages, portraits and snapshots of who we were and are, predictions of who we will become. They are sacred spaces because they are where we keep our stories. Libraries have shelves and shelves of bright keys to imagination and imagination is how we create our worlds. I have always wanted the entire city of New York to become a library: empty storefronts full of books to borrow with corners for nannies and parents to read to toddlers, book-borrow stands like newsstands on every street, beautiful old buildings like the St. Agnes library in every community, mobile libraries cruising commercial strips and neighborhoods, a free library in every corporate building and condo lobby, library kiosks in the parks. If Gotham dedicated its resources to transforming the city into one huge library, we would be the most literate, intelligent, imaginative, tolerant, peaceful and positive metropolis on the planet–no end to the possibilities. 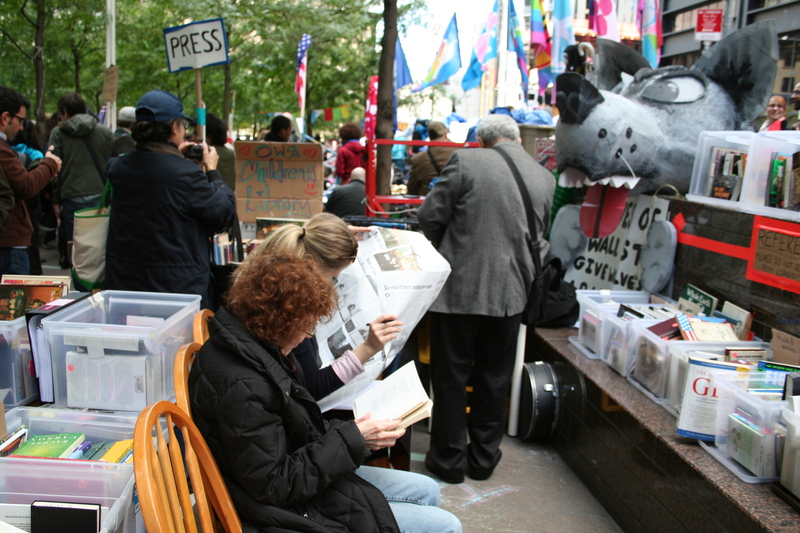 My favorite energy spot at the Occupy Wall St. encampment in Zuccotti Park is its library. 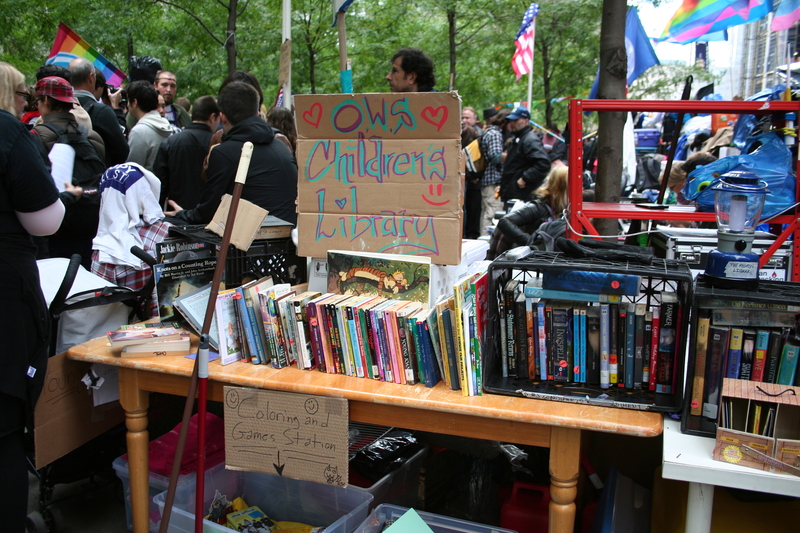 The existence of the OWS People’s Library speaks volumes (even Shakespeare had no problem with the occasional pun) about the mindset and motivation of the 99% protesting in the park. 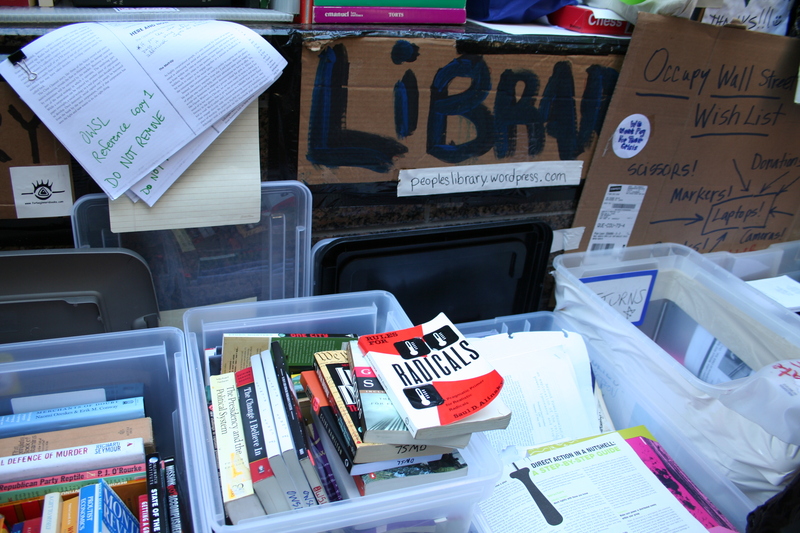 You can donate books. You can borrow books. 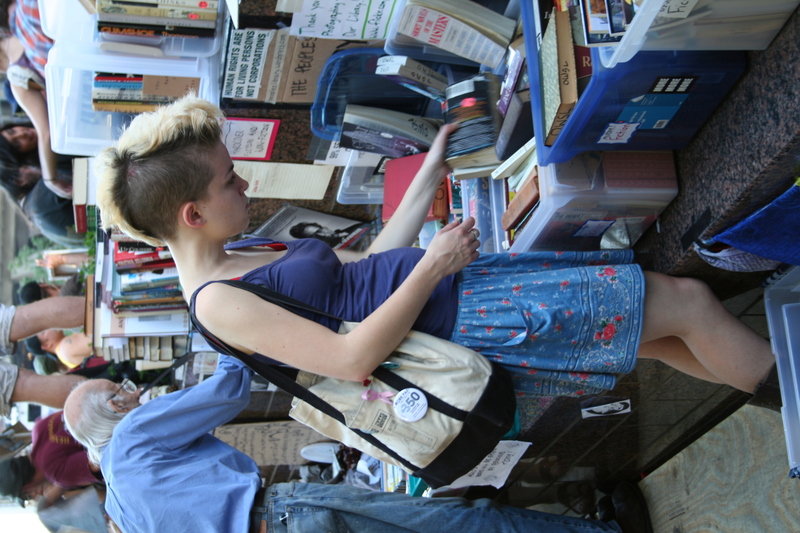 You can even keep books if you promise to pass them along to someone else when you have finished them. You can sit and read a book. So one day, shortly after my first visit to the library, I did.